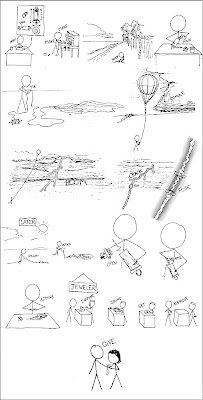 I was looking through xkcd a few weeks ago and saw a cartoon about making a glass necklace, since then I’ve thought about it everytime there is thunderstorm (there was one today). Apparently I am not the only one. If you aren’t familiar with xkcd take a look, there is something nice about the stick figures that make this comic. The humor isn’t always 100% on target, but it usually is— though I should warn folks that it is fairly geeky. One of my favorite xkcd’s for example, is nonsense to non-geeks. To be fair, it is made by a former NASA Roboticist.